John Ries was on a business trip in Stuart Tuesday. He was in town to discuss his 'stink stopper' invention. Normally, the devices are used to aerate lagoons on dairy and pig farms. But Ries knows they can do more. STUART, Fla.-- John Ries was on a business trip in Stuart Tuesday. He was in town to discuss his 'stink stopper' invention. Normally, the devices are used to aerate lagoons on dairy and pig farms. But Ries knows they can do more. 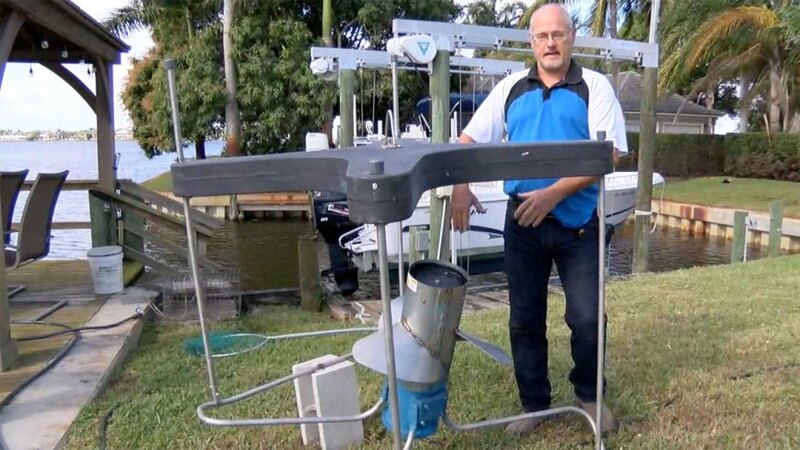 “Even on a windy day, the algae can’t blow against the current we create here," said Ries, showing off the device. Ries was part of a Martin County study of the algae crisis last summer where his devices were deployed at Shepard Park in Stuart. “We showed that this is a viable product," said Ries. The device doesn’t get rid of the algae, but it prevents it from entering somewhere. Stuart city spokeswoman Ben Hogarth said the product was promising. “It was clear that the water had been better aerated which was really the initial intent of putting those out there to see if we could send the bloom away from the canal so it didn’t build up," said Hogarth. Tuesday, Hogarth talked at a city commission workshop about what’s been done on the city, county and state levels when it comes to the water. The city is looking to see if there are other projects out there that could gain approval at the higher levels. “Making sure DEP and regulators are on board that they understand all the safety precautions that come into play," added Hogarth. Reis is hoping his invention can get more attention. He also plans to meet with government agencies on the Gulf Coast of Florida to see if he can set up a demonstration there."